The holidays are fast approaching, which means your office is probably in the throes of organizing a Secret Santa or White Elephant gift exchange. And that means you’re knee-deep in wondering what gift-worthy something you could possibly find without breaking the bank (or busting the very-low ceiling of your office gift limit). Great choice for your green-thumbed coworkers. Livens up any dull work space. We’ve been there, done that. And by that, we mean we’ve done the shopping for you. We’ve rounded up 25 coworker-pleasing holiday gifts that are sometimes smart, sometimes punny, and almost always functional. And we’ve kept them under $25, with a bunch hanging out at the $10 or $15 mark. This year is your year. Finally, everyone will want to steal away your White Elephant contribution. For your coworkers with the style to turn a cubicle into an art show, there’s no better way to mark the days than this 2018 BAN.DO wall calendar. It’s packed with 12 months of rad artwork, courtesy of the brand’s girl gang, and is guaranteed to put a little inspiration into any workspace. Plus, stickers! This calendar will be the talk of the office holiday party. It’s the gift that keeps on giving! Now you can subtlety invite yourself over for drinks, when you gift a favorite coworker with these wine glass charms. They’re cute little cork numbers, with varied and punny sayings, like “I wine A LOT” and “cloud wine,” and we bet the office will think it’s a perfect gift. Depending on your price range, pair with a nice (well, under-$15 nice) bottle of wine, and you’re golden. Who doesn’t love a good novelty mug? (Answer: No one. Everyone drinks coffee, or tea, or at least water.) While many novelty mugs are a little too racy for an office gift exchange, this safe-for-work version strikes just the right balance of kitchy and cool. Seriously. The heat-activated, color-change effect is pretty sweet – and educational. Learning the constellations will never again feel like studying for a test. Constellations include: Cassiopea, Perseus, Saggitarius, Hercules, Andromeda, Scorpius, Taurus, Ursa Major (Big Dipper), Ursa Minor (Little Dipper), Orion, Gemini. With this infuser mug, you’re sure to please even the most pretentious tea-drinker in the group. The super-fine infuser/strainer can handle even the smallest loose tea leaves, and your gift recipient is sure to appreciate that the whole shebang – infuser included – can be thrown in the dishwasher at the end of the day. Provided your office has a dishwasher. Welcome to a new frontier in rain gear: the reverse-folding umbrella! If you think the umbrella industry couldn’t innovate any further, you were wrong. This incredibly cool, extremely functional design reverse-closes – the mechanism slides up, not down the shaft and the umbrella itself closes in on itself – to trap water and keep both your giftee (and the car floor) dry. Okay, so this one’s more of a stocking stuffer, gag gift, or fun extra to round out a bigger gift, but it’s golden. Nifty Notes always offer snappy, sometimes sarcastic notes, and these Office Citations are no different: With this gift, your recipient is now the proud owner of one of the most productive, most passive-aggressive work gifts ever. You’ll no doubt be the hero of the White Elephant game! If your office is down with NSFW humor, then this is THE gift to give. Cards Against Humanity is the original “party game for horrible people,” guaranteed to make you snort spiked eggnog out of your nose. If your coworkers have already played this inappropriate game, not to worry: CAH has been updated with 150 new cards for all-new laughs. And hey, if NSFW doesn’t fit your office vibe, give the gift of Exploding Kittens. Bring a little bit of bad*ssery (and excitement) to your office holiday party, with these awesome ninja star magnets. In addition to looking fierce on a filing cabinet or office fridge, these tough little guys are strong enough to hold up important memos (pair with Office Citation notes, above? ), photos, and other reminders. They may also help you fight off the zombie apocalypse, so we’re calling these a gift-exchange must. Dun-dun-dun, dun-dun-dun, dun-dun dun! Invite Darth Vader to crash your holiday party with this way-too-cool Death Star cutting board. Not only does it look great but it’s also fully operational (muahaha) with strong glass surface and non-skid feet. If you work in a geek-rich environment, this one’s guaranteed to be stolen, again and again, during your White Elephant exchange. If you’re worried no one at the office will like your gift, here’s a safe bet. After all, few people in this world don’t love the sound and smell of a fresh, crackling fire. Enter this innovative little candle, which not only smells like a freshly built fire, but sounds like one, too! Bonus points for a super slow-burning candle, which lasts up to 100 hours. Whether your giftee-to-be is a serious film buff or just appreciates a good drink, this quirky (and punny) recipe book is sure to please. No matter the cinematic stripe, there’s a drink to match: Ti-tonic, Some Spike It Hot, Taxi Screw-Driver, and West Cider Story, just to name a few. “Gone with the Gin” includes 50+ delicious drinks and movie-themed munchies, with a side of film commentary throughout. Have a coworker who’s constantly munching on something crunchy? He’ll love this hand-blown glass bowl, which is not only classy but functional to boot! The contemporary design is shaped like an old-time goody bag, similar to what you’d find in a 1950s era five-and-dime candy shop, with realistic crinkled edges and sides. Beyond candy, it’s also perfect for holding nuts, pretzels, and other desk snacks. Speaking of old-fashioned, if your coworker likes to blow off steam with a traditional game of darts, look no further in your gifting than this set. This dartboard uses a powerful magnet to hold darts in place, thus eliminating the need for sharp-pointed darts. Bonus: since there are no safety hazards here, you may even be able to convince your coworker to install this board in the break room! Coworker with a black thumb? Real-look, artificial plants can be her saving grace. We really like these artificial succulents, which come in attractive glass vases and sit nestled in pebble beds. They’re perfect to sit on a desk, bookshelves, or even to hang on the wall or from the ceiling (jute hangers, not included), if your gift-recipient has interior design tendencies. Every now and then, you run across a gift so stunning that you can’t believe it’s in your price range. That’s how we feel about these beautiful coasters, sliced from natural-dyed agate geodes. They’re a definite focal point on any coffee table (or office desk) – a great choice for hard-to-gift coworkers with style (and who seemingly have everything). We love all the colors, too! If your coworker has jumped onto the adult-coloring bandwagon, then look no further than this perfect gift. Prismacolor soft-core colored pencils are The Pencils for semi-serious colorers: strong and break-resistant, while laying down beautiful shades and rich colors. We really like this gift set, which includes a soft-core sharpener and squeaks (due to sheer merit!) onto our list at just $1 above our $25 threshold. Sloths are “on trend,” making this plush a great choice for your Millennial-aged coworkers, but they’re also one of the cutest animals in the world, making this also a perfect gift for anyone at a holiday party. We like this realistic three-toed sloth plush, which is not only adorable but highly cuddle-able, thanks to soft fabric and squishy insides. We’re circling back to desktop decorations, this time with a choice for your green-thumbed coworkers. 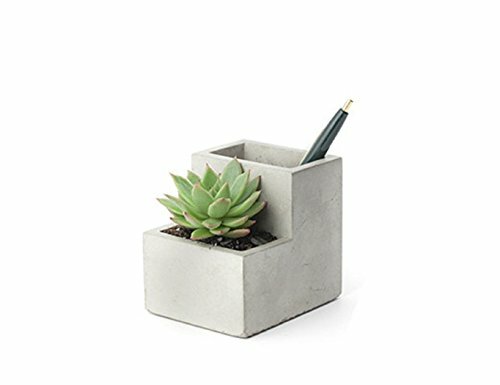 This modern, clean concrete planter is a perfect accouterment atop any desk, offering a space for a small plant and a terraced base to hold pens, business cards, or other office supplies. Let’s call it a new taking on going green at the office. Office gift-exchanges are a great opportunity to buy fun gadgets, décor, and what-nots that you know your recipient wouldn’t otherwise buy. These bookends fit that description: they’re stainless steel, they’re nonskid, and they’re shaped like little men. They also successfully hold up your giftee’s books, so they fulfill their promised function. Gift your coworker the joy of fresh, delicious coffee, even at his desk. This pour-over coffee maker from big-name Bodum is the perfect blend of quality coffee-maker and low-tech, no-fancy-anythings required: simply add a great coffee, pour hot water, and you have a seriously good afternoon cup of java. Without even leaving your desk. Want a gift that’ll get a laugh (while still being somewhat functional)? These crab pincher-shaped pot holders are always a favorite: sure, they’re silly and good for a smile, but the thick, heat-resistant silicone effectively protects hands from oven and stovetop heat. They’ll come in handy when you’re in a pinch, if you know what we mean! For the wellness guru at the office, this 100% natural Himalayan salt lamp is sure to please. Not only does it provide beautiful and relaxing mood lighting, but this handy little lamp is also touch-controlled and dimmable – put it anywhere, and it’ll throw off appropriate levels of pleasant, amber light. We bet your gift-recipient will also like the attractive craft basin, which showcases the natural beauty of the salt rock. For the coworker who’s just barely hanging on to the sane side of the stress pendulum, this desktop sand garden is a much-appreciated holiday gift. A proven meditation device (and stylish desktop accessory), this compact sand garden is a good distraction from stressful moments. We also like to think of it as the original fidget spinner – a calming way to center yourself, after a hectic day. Cell phone photographer in the office gift pool? You will be a holiday hero with this add-on lens kit, which offers a universal clip lens hood, wide-angle lens, macro lens, and UV filter compatible with almost any smartphone. This handy invention fills the gap between what a phone camera can do and what it actually does, helping even causal photographers capture great photos from their phones.